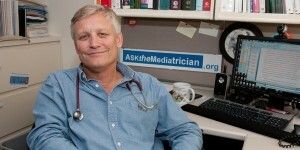 Add an Ask the Mediatrician Button to YOUR Site! Posted July 30, 2009 under Ask the Mediatrician. Do your users have questions about media and kids’ health? Would you like to direct them to Ask the MediatricianSM? Follow these instructions to add an Ask the Mediatrician button to your own website! If my kids grow up without TV, will they feel left out? Q: Our family does not have a TV or video game system in our house since my husband and I don’t approve of the shows and games that are out there. Some of my friends tell us that the kids will feel left out of social groups since they won’t know about the shows and characters their friends talk about. What do you think? Posted July 28, 2009 under Ask the Mediatrician. How should parents introduce TV to their kids after they turn 2? Posted July 27, 2009 under Ask the Mediatrician. Q: I am an educator, and I often recommend to parents that they follow the American Academy of Pediatrics guidelines for no TV under age 2. I’d love to be able to tell parents how to go about introducing TV to kids after they turn 2. What do you recommend I say to them? How do we handle the barely clothed adults on billboards? Posted July 21, 2009 under Ask the Mediatrician. Q: How do we handle all the barely clothed adults that we see on billboards, in the form of underwear, perfume, and even soft drink ads? My 7-year-old finds it “funny” that all the young people in the ads always have their pants unbuttoned—that is, of course, when they are indeed wearing pants. How can I talk to my husband about media violence? Posted July 16, 2009 under Ask the Mediatrician. Q: I have 8- and 10-year-old daughters and a 6-year-old step-son. My new husband thinks that PG-13 movies and violent video games are fine for all of our children, even his 6-year-old. But I never let my daughters use violent media because as a school counselor, I am well aware of the dangers of media violence for children. How can I educate my husband on this issue? How can I address sexism in the media with my kids? Posted July 10, 2009 under Ask the Mediatrician. Q: I see a lot of TV shows where women are not treated respectfully. How would you recommend talking to kids about sexism in the media? It’s rather like having a drunken bully over for dinner every night. How do you explain to your kids why you keep letting this kind of person into their home?